What is mindsight? In the words of the author, Dr. Daniel Siegel, “Mindsight is a kind of focused attention that allows us to see the internal workings of our minds…without being swept away by them.” Mindsight is essentially Siegel’s term for mindfulness meditation. 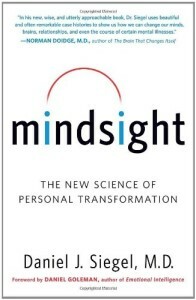 Mindsight: The New Science of Personal Transformation teaches us the power of focused attention and provides steps to apply it. 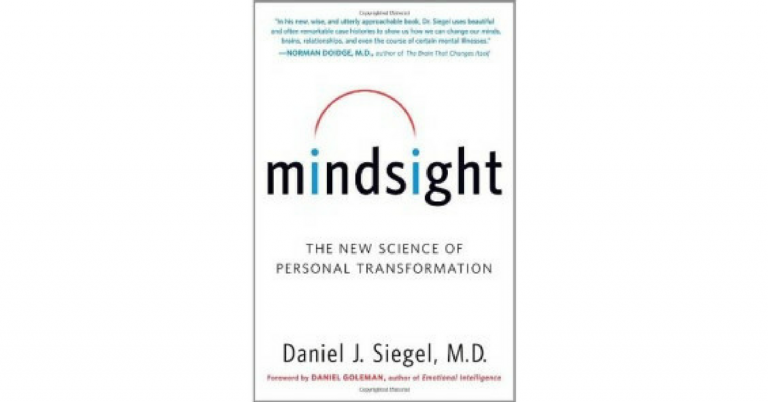 Dr. Siegel guides readers through lessons in the brain’s areas, functions, and new discoveries in neuroscience, and then walks readers through case studies where focused attention was used to boost success and happiness. The main lesson is that you can achieve well-being through becoming more responsive than reactive; observing and improving your behaviors and reactions, rather than being controlled by them. This is accomplished by practicing focused attention through meditative and mindfulness practices. Focusing on the breath – The science is clear that focusing on the breath boosts health, lowers reactions to stress and increases empathy. Wheel of Awareness – This is a meditation technique that Dr. Siegel created and used successfully in his career. You can listen to the guided meditation and get more information here. “Stay With That” – This is a practice of noticing and naming your feelings without judgment. Naming your unpleasant feelings works because the parts of the brain that name an unpleasant emotion are different from the parts that feel it. Naming helps ease most emotional states. As I often relay inworkshops, psychologists say “name it to tame it”. SIFT – In this practice, Dr. Siegel teaches readers to focus their attention through the simple process of deliberately accessing your Sensations, Images, Feelings and Thoughts (SIFT). This is a similar technique to “Stay With That”. Body-Scan – To do a Body Scan mediation, sit or lie down comfortably, find your breath, and then focus your attention on each part of your body, gradually moving from the top of your head to the tips of your to toes. Walking Mediation – Learn about walking meditation and 3 other techniques in Mindful for a Moment: Integrating Attention into a Busy Day. The results of these practices are supported by the case studies and stories presented in this very informative and applicable book. It’s a great read for those interested in learning more about the brain, and how to harness the power of attention to change your brain and boost your happiness. All of these forms of mindfulness meditation will help you Empower Your “Inner CEO”. Have you experienced the benefits of focusing your attention through mindfulness or meditation? What behaviors and reactions might you be able to improve through these practices? Share your thoughts and stories in the comments below. If you found this book review helpful, you might want to check out my other recommended readings in theresource section, or subscribe to our mailing list to make sure you don’t miss out on future book reviews, science news, and actionable tips for increasing happiness in your workplace. ← Get Moving and Grooving at work!